CRAIC Technologies says the addition of ‘kinetic spectroscopy’ capabilities to its 20/20 Perfect Vision microspectrophotometer gives the instrument numerous new applications. Kinetic spectroscopy allows the device to monitor a broad spectral range by absorbance, reflectance, and optical emission, over a period of time, and plot the results. The spectral range covered is from the deep UV to well into the near infrared (NIR). Suggested applications for the technology include biological time resolved analysis, measurement of the gradual degradation of LEDs, and monitoring chemical reactions on metallic film substrates. Kinetic spectroscopy gives an added dimension to two-dimensional imaging, with the third dimension being time rather than depth, and allows these three dimensions to be mapped as desired. 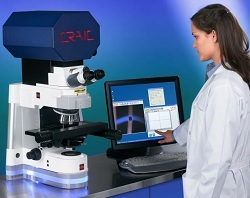 “Adding kinetics and time-resolved microspectroscopy capabilities makes the 20/20 microspectrophotometer the ideal laboratory tool due its high spatial resolution and sensitivity,” says Dr Paul Martin, president of Craic Technologies. The 20/20 Perfect Vision microspectrophotometer incorporates a high speed spectrophotometer and a UV-visible-NIR microscope and, with the kinetics package, can acquire data from microscopic samples by absorbance, reflectance or emission.